TrinityP3 recently launched the Ad Cost Checker online benchmarking system to allow advertisers, procurement and agencies to be able to benchmark their rates against the industry. The purpose is to provide a robust assessment against which agency rates can be compared. But as I have pointed out previously, rates per hour or hourly rates are not a measure of cost. An agency can be half the price but take three times longer to deliver the same results, so they end up costing 50% more. So what is the role of hourly rates and rate benchmarking if not cost? 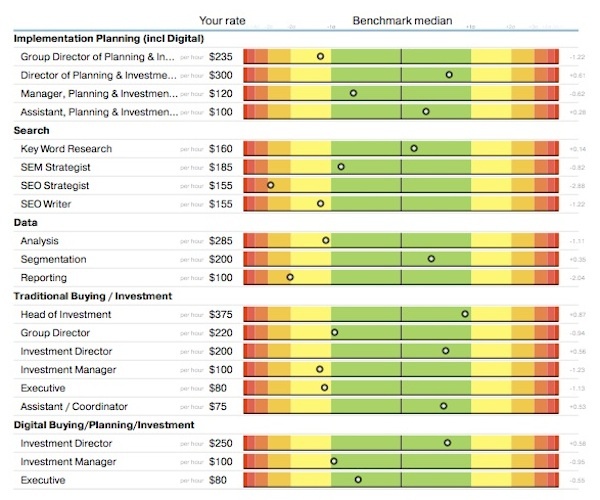 Lets look at the benchmarking report from Ad Cost Checker. The first thing you note is that the rates benchmarked are displayed against the distribution of the data pool. The mean is the average against the pool. The data pool has a statistically significant number of data points to ensure it is robust. The increments either side are standard deviations from the mean and are plus or minus one, two, three standard deviations, up to five standard deviations. One standard deviation is indicated in green and as the number of standard deviations increases the colour gets increasingly hotter through yellow and orange to red. What does this statistically mean? Under a normal distribution, the number of standard deviations provides the probability confidence interval. It means that within one standard deviation the rate is 68.26% to sit within this range. Two standard deviations means the rate is 95.44% likely to sit within the range and so on. For an advertiser, value means it is important to understand the quality of the people the agency has on your business. Either the agency pricing strategy or the underlying salary is a good measure of how an individual is positioned in the market place. Much like an automobile, a prestige sports car is not the same price as an economy runabout. By understanding the rate by role against the market price you can then assess the quality or performance of the person in that role. If your agency rates are within one standard deviation it means that the agency rate is within the average range. But if the rate is higher than the mean or greater than one standard deviation, this does not mean that the agency is charging too much. It simply means that the agency rate is above the average. It is then a matter of determining if the quality or the value of the person in that role is also above average. Similarly, if the agency fee is below average, and is two or more standard deviations below the mean, then the question is are you getting more than what you are paying for or are the people in that role similarly below average. It is simply a matter of determining if the person in that role is above or below average. Managing the overall agency remuneration means both the retainer or fees and the rate card. You can then use the benchmarks across the various disciplines (account management, technology, creative, strategy etc) and the seniority of the roles (Junior / Executive, Mid-level / Manager, Senior / Director). In this way you can develop a view of the mix and level of resources across disciplines and seniority to get the ideal and most cost effective mix. The best result is not getting the agency rates to all sit on the mean. This simply means that everything is average. But it could be that one agency has fewer senior staff in the resource plan and more junior staff, but the senior staff are generally lower cost and the junior staff are high against the industry mean. This has a bigger impact on overall cost and service levels than another agency that has the same staffing mix but the senior staff are just above average cost and the junior staff are below average cost. Agency management can use the rate benchmarking to implement and support a pricing strategy. Rather than simply applying an overhead and profit multiple to salaries, you can portion the more established and credentialed staff at a premium, while discounting other staff. Basically it means that rather than just be a resource farm, you take on the role of a resource manager, maximising the return on your higher profile and more respected resources and balancing this with the more commoditised resources. While rates are not a definitive determination of overall cost, they are an important factor in considering the value of the agency resource. The value of agency resources to the advertiser. 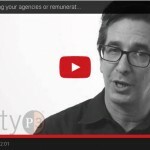 The value of the agency resources to the agency. The overall value in retainer and production costs managed by procurement. The role of the industry rate benchmark is not about making all agencies and all resources conform to a mean, but to use the variance to the mean as the basis of determining this value. Are you compensating your agencies or remunerating them? How long does it take to create a big advertising idea?